Update, 1/3/2012: This is a puparium of a parasitic fly, not a moth pupa. The remnants of the caterpillar can be seen at both ends. Busck's original 1902 description (Proceedings of the United States National Museum 24: 742) of this moth, which he placed in the genus Depressaria, can be viewed here. 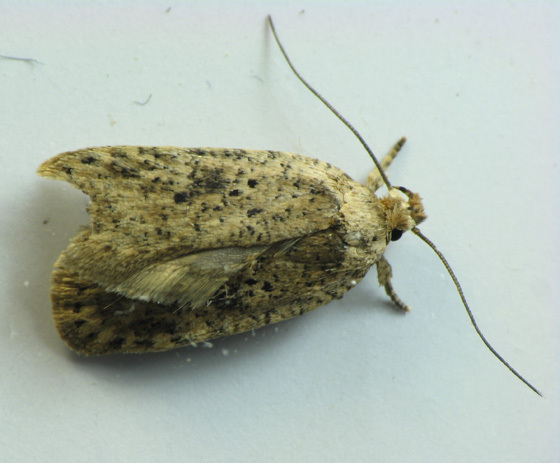 As can be seen, the first published spelling of the species name of the moth is "senicionella" (obviously because, as also is seen in the description, Busck spelled the genus name of the host plant "Senicio"). Furthermore, in the two places in which Busck refers to the moth by name in the text of the description, he calls it "seniciella," which is a misspelling, as is the spelling "senecionella" seen on the HOSTS database. Moved from Unidentified Leaf Rollers and Tiers. I suspect that this and a few other similar looking leaf rollers turn out to be members of the family Elachistidae.